The last World Challenge Cup series ended in Minsk, Belarus on august 17-19 prior to the World Rhythmic Gymnastics Championship in Kazan scheduled for September 11-16. Representatives of Azerbaijan also participated in the tournament, where more than 200 gymnasts from 39 countries competed for the best title. 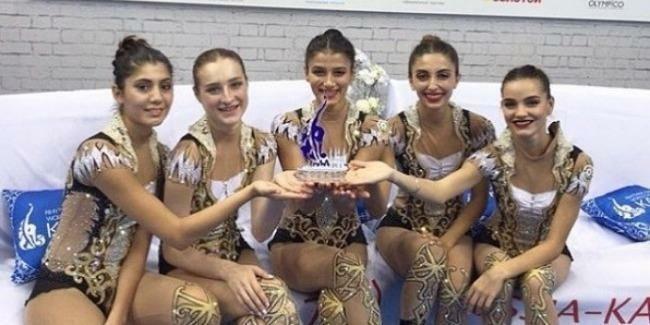 Aliya Pashayeva, Siyana Vasileva, Ayshen Bayramova, Diana Doman and Zeynab Hummatova, who represent the country in the group program, were able to take part in the finals among 20 countries for their composition with two rope and three balls. The girls took 7th place in final stage with 19,750 points, which allowed them to get ahead of Finland. The victory was celebrated by Russia, Italy took the second place, and the Japanese became the third. Moreover, the national team took first place in the overall standings of the current World Cup season in an exercise with three balls and two ropes. Team captain Siyana Vasileva commented on the result. “We are very pleased with the success. Our group took part in all four World Cups Challenge and everywhere showed good results. This success motivates us. We will continue to work, so that in the next season the indicators were no worse. Well, and ahead, we are waiting for the World Cup in Sofia, the immediate preparation for which is already in full swing,” she told azerisport.com.